State Road 190 comprises one half of an arc looping southeast from Florida 85 into the city of Valparaiso in Okaloosa County. The state road travels 1.23 miles along Valparaiso Parkway between SR 85 and SR 397 (John Sims Parkway), primarily serving local interests and some Eglin Air Force Base traffic. The first shield of Florida 190 resides on the transition ramp from Florida 85 north to Valparaiso Parkway. Drivers quickly enter the city limits of Valparaiso around the bend. Photo taken 04/08/11. Beyond Valparaiso Elementary school and City Hall, State Road 190 curves toward Florida 397 (John Sims Parkway). Florida 190 originally turned northward and a portion of old alignment remains in use as a service road to the left in this scene. Photo taken 02/13/10. Florida 190 concludes at Florida 397 (John Sims Parkway). 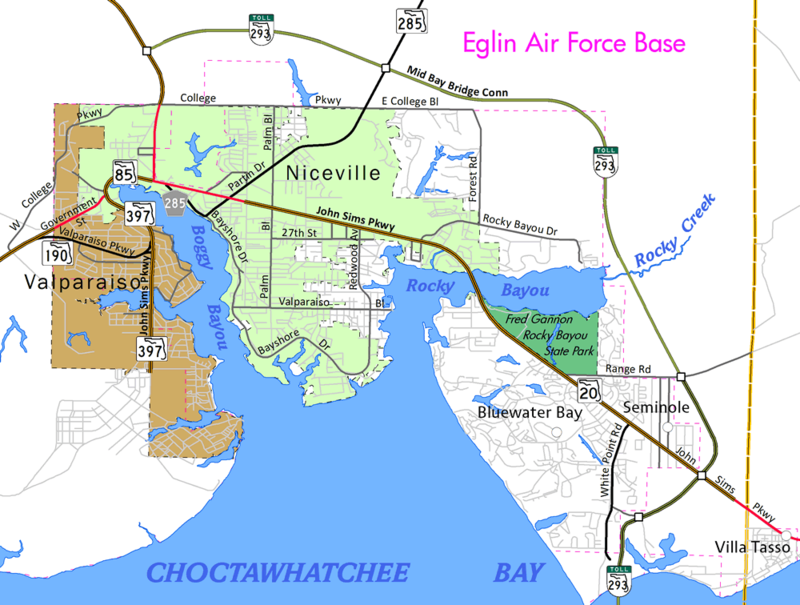 The state road exists in two portions, with the northern segment connecting Niceville with the East Gate of Eglin A.F.B. Photo taken 02/13/10. Sometime in either 2010 or 2011, the shield assembly for Florida 397 along Florida 190 east was turned perpendicular to Valparaiso Parkway. Photo taken 05/13/12. Florida 397 runs 2.17 miles from Florida 85 in Niceville to Eglin Air Force Base. The arterial carries four lanes overall. Photo taken 02/13/10. Drivers turning onto Florida 190 (Valparaiso Parkway) are immediately faced with the first westbound shield. Photo taken 05/13/12. Florida 190 overtakes its original alignment (Old SR-190) just west of John Sims Parkway. Motorists see this mileage sign at the confluence, posted 12 miles from downtown Fort Walton Beach. Photo taken 05/13/12. An indication of Florida 190's former alignment is the placement of this second westbound reassurance marker between Old SR-190 and Rockford Street. Photo taken 05/13/12. Exiting the city limits of Valparaiso, Florida 190 (Valparaiso Parkway) approaches Florida 85 surrounded by grounds of Eglin Air Force Base. Photo taken 05/13/12. Florida 190 ends as Florida 85 southbound leaves Valparaiso for Shalimar and Fort Walton Beach. The state road follows Government Avenue northeast to Florida 397 (John Sims Parkway) in Niceville. Photo taken 05/13/12.